"Yea," Rosh agreed, "it is betrayal. But even though abstractions like these were originally based on some rationale, over time people generally forgot the reasoning and just continued to habitually act on the generalizations themselves." "Since abstractions are distillations of insights, some of these may not literally make much sense either, if their language or context is changed." "Even within the same language, they can sometimes simply be pointers that get translated and interpreted by our brains." "It is our brain that translates words to create meaningful images. To do this, it needs to know both language as well as the context." "Comprehension created from words will be wrong, if their translation or context is wrong." "Interestingly, early efforts at translating between languages often used 'brute force' approach which aimed at transliterating words and phrases in a text regardless of linguistic nuances like grammar and context, or its syntax and semantics." "Hilarious rumors have existed for decades about experiments with Natural Language Processing (NLP) machines which transliterated phrases from one language into another, and transliterated the results back into the source language, to see if they'd get the same words they had started with." "For example, English phrases like 'Out of sight, out of mind' came back from Chinese as 'Invisible Idiot', and 'The spirit is strong, but the flesh is weak' came back from Russian as 'The vodka is good, but the meat is rotten'." "The Captain remembered that in his culture it was wrong to betray someone whose salt you had eaten. Perhaps he took the saying to literally mean eating salt. Therefore no salt eaten, meant no betrayal. Since Marjina also picked up on this connection subconsciously, she got curious." Marjina now wanted to see this guest for herself. She came into the dining room accompanying the slaves as they carried the fruits in, and helped them spread the platters around their guest. Khwaja Hasan seemed to be truly enjoying himself, engrossed in the music being played. Observing him keenly as she moved around him, ostensibly supervising the slaves, she suddenly felt her throat constrict in fear. There appeared to be a dagger concealed inside his robe. 'Why would he come to a feast with a concealed weapon?' her mind asked, sensing danger. She observed him and his movements now with a suddenly increased clarity. She noticed how he held his head, how he sat and conversed, and how he laughed. Her ears intuitively tuned into the sound of his voice, shutting out all other sounds. Something bothered her about him. But what? "Are the fruits to your taste?" Ali Baba was asking him. "Ma shallaah (ما شاء الله)," he drawled, showing his appreciation. She came to a stop behind Alibaba, who sat beside Hasan. She examined Hassan from behind his side. Even before she knew it, her eyes were subconsciously chipping away at his disguise. His profile filled her with a sudden premonition, but she could pin nothing remarkable despite her growing unease. 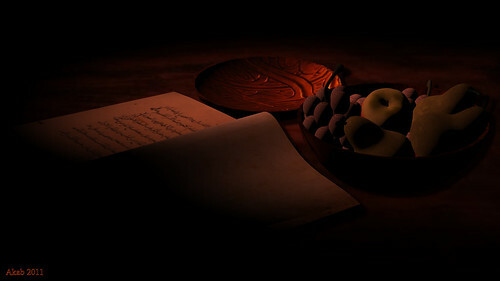 Having placed their platters around Hasan, the slaves were leaving. Marjina left the room with them. Once outside, she instinctively dimmed the lamps outside the dining room. Shadows raced in on her from all sides. She paused in that darkness outside, peering back in, wanting to observe him a little more without arousing his suspicions. She watched quietly from outside, as slaves shuttled in and out of the dining room, carrying in fine wines and nibbles, filling glasses all around, and carrying out platters as they emptied. From her vantage point, it quickly became obvious that Khwaja Hassan was not only abstaining from using salt at the meal, but he was also drinking sparingly from his cup, even though enough wine was available beside him and being served all around. 'Maybe, he doesn't drink much,' she speculated. Like an animal, which had perhaps sensed that it was being watched, he turned back suddenly and stared out into the relative darkness outside the dining room door. Rattled by his sudden movement, but saved by the darkness, she seamlessly stepped away from his line of sight, undetected. But the motion was enough for her. With an intuition and reflex like that, she knew in her heart that he was no trader merchant. He was a hunter, and he wasn't here for fun. She knew fear again. She walked away to the kitchen, deep in thought. Then it came to her. What he wanted, and what he was waiting for. "Stay by the master now," she instructed Abdullah when she saw him. "Take your tambourine with you. Tell him, I will dance to entertain his guest tonight. And ... get me a sword before you go." 'The sword dance!' Abdullah thought excitedly, as he brought her a sword. He hastened to the dining room to inform Ali Baba, even as the other slaves were getting ready to serve the main course. Marjina was a fine belly dancer, but she had stopped performing for the household since being granted her freedom. She changed slowly into her dancing costume. She had sent Abdullah to be nearer to the master, but had dared not tell him of the danger they were in. She glided into the dining room as the dessert platters were being carried out. Bowing low, she asked Ali Baba's permission to perform Raqs. Ali Baba gave his permission, saying, "Dazzle Marjina! Let our guest remember this night." She bowed low again. The lamps were dimmed and more wine was served. Music began. She started slowly. Dancing sensuously. Her belly moved with the beat. So did her sword.